Shoes can be really annoying to store. They become a total mess when thrown into a wardrobe and take up most of your closet space in the process. A shoe cabinet or rack is the best way to keep muddy shoes off the carpet, and is also a way of keeping hallways and bedrooms looking neat and tidy. Here we’ve picked out some of the best shoe storage solutions for your home. The type of shoe storage you pick really depends on where in the home you’re placing it, and what look you’re going for. 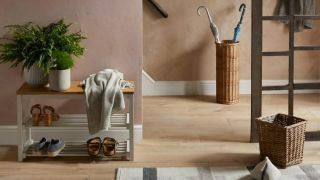 A storage bench like the Cox & Cox Low Wooden Box Unit has an open front which would work well in a hallway by the front door so it is quick and easy to find the shoes you need before you leave the house. If you don’t like the idea of your shoes being on display at all, then a shoe storage cabinet such as the Home Large Slatted Shoe Cabinet from Argos will keep your shoes (and their smell) behind closed doors. Other than that, it’s down to personal style preference so take a look at our list to see what’s best for you. This wooden box unit has been designed to resemble that of old fashioned shoe lockers with a modern twist. It is a great shape and size for placing in a hallway or utility room and with 8 cubby holes there is enough space for the whole family to have their favourite pair of shoes at the ready by the front door. It can also be transformed into a bench by placing cushions on the top – creating a convenient place to sit while slipping in and out of your shoes. This white wooden shoe storage bench would fit in nicely with shabby chic or minimalist décor in homes that want to keep their shoes out of sight. The unit has three wicker storage baskets that can each fit multiple pairs of shoes, so if the wooden box unit above doesn’t have enough cubby holes, then this could be the shoe storage solution for you. Similarly, it has a bench with a cushion that allows space in the hallway for you to take your shoes on and off before entering or leaving the house. This large storage unit is both smart and functional. The tall unit has fold out shelves which can each hold around 4-6 pairs of shoes, making this a great unit for anyone who finds they never have too many shoes. It could fit in a hallway but also look equally as good in the bedroom with its oak finish with contrasting grain which is finished with a lacquer to give it lasting finish that won’t scratch or wear. For those with a bigger shoe collection or a large family, this dark mahogany cabinet is a sturdy unit that will provide all the space you need with room for up to 28 pairs of shoes up to a size 10. The unit is robust and looks smart with panelled doors and adjustable shelves. You’ll be able to arrange this shoe storage cabinet in any way you like, and it’s freestanding so you can place it anywhere in the home with ease. Users also found it to be a great hallway cabinet for hats, scarfs and gloves as well as shoes. If you don’t have room for a few pairs of shoes in your hallway then it’s likely you don’t have room for a new piece of furniture either. If it’s a space saver you’re after, then this over the door shoe storage organiser could do just the trick. With 20 pockets, this wall hanger could hold up to 20 pairs of shoes or 10 larger pairs of shoes and it also comes with 3 clips at the bottom to hang boots, bags or scarves. The fabric is durable and holds up well when a maximum capacity and the hooks are said to be gentle on door frames so you won’t get any scratches.